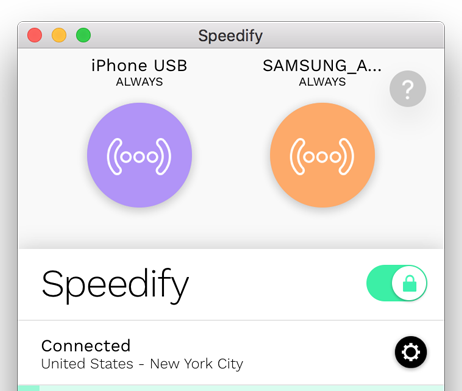 With Speedify, it’s easy to combine your Android's connection with your iPhone's connection on your Mac. This allows your Mac to use the cellular connections from your phones as additional internet sources. In this article, we are going to walk you through how to do it. Step 1: Tether your Android phone to your Mac using a USB cable, following the steps outlined here. Step 2: Tether your iPhone to your Mac using a USB cable, following the steps outlined here. Step 3: Combine connections by turning on Speedify. When you launch Speedify, the software automatically detects the tethered Android and tethered iPhone connections. You will see them each contained in a Connection Bubble near the top of the Dashboard.